/ Bei optimalen Bedingungen wird man auf der Gletscherzunge des Gaisbergferners, welche vom schattenspenden Kirchenkogel 3280m profitiert, durchaus noch lockeren Pulverschnee vorfinden. / Im Frühjahr, wenn sich der Schee an diesem Hang in einen harten Schmelzharschdeckel umgewandelt hat, dann sind hier Harscheisen unbedingt einzusetzen. / Im nicht allzu steilen Gelände geht es unschwierig durchauf. / Blick gegen Westen am Kirchenkogel 3280m vorbei zum Wasserfallferner. / Ist der Nordwestgrat mit Schnee bedeckt, dann kommt man unproblematisch im Stapf bis zum Gipfel. / Bei fehlender Schneeauflage bewegt man sich zwar im klettertechnisch leichten, allerdings im brüchigen Fels auf hartem, bei Sonnenschein aufweichendem Permafrostboden. Rutsch- und Absturzgefahr besteht. Die angesagteste Steilabfahrt im Obergurgler Tourengebiet. Along the gravel road from Obergurgl south-eastwards to the middle station of Hohe Mut mountain gondola, steep ascent to Gaisbergtal valley. Continue to Gaisbergferner glacier (end of marked hiking route! 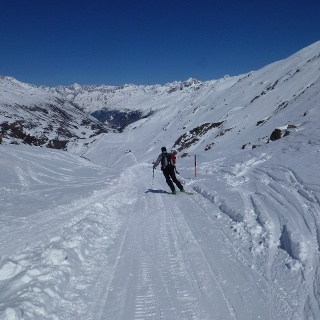 ), keeping to the left on the glacier. A steeply climb path travels up the side moraine on the (orthographic) right side that takes you to the small glacier field of Hochfirstferner. Roping up is absolutely necessary here: follow the northern edge of the glacier (crevasses!) until you get to the peak flank (below), cross the mountain fissure (can be quite challenging if there is no snow!) 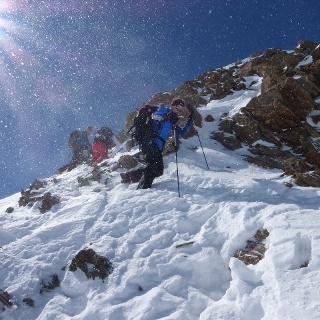 and ascend on the 45-55 degree steep flank to the rocky but rather easy-to-reach summit of Hochfirst. 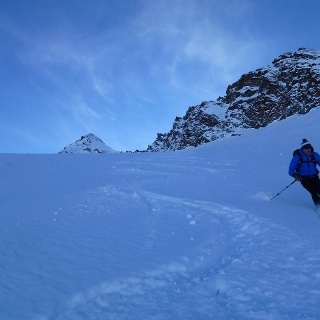 The ski tour to the Hochfirst 3403m offers the alpine touring enthusiast the most challenging steep descent in the tour area of ​​Obergurgl, which can only be compared with the direct northern flank at the Granatenkogel 3318m. Starting in Obergurgl at the base station of the Hohenmuhlbahn 1915m so to the summit to a good 9.0 kilometers not quite 1500 meters of altitude. If you use the Festkogelbahn as an ascent aid and drive to the valley entrance of the Gaisberg valley, the climb is reduced to 6.5 kilometers, or 1100 meters of altitude. In the Gaisbergtal it is first for a long time along the valley floor over mostly rather flat terrain towards the south. The two impressive summits, the Hochfirst, as well as the Liebener peak 3399m, are growing ever more powerful. After entering the Gaisberg, one branches off at Pt. 2700m to the left to reach the Hochfirstferner over a 35 ° to 40 ° steep slope. In the spring, under optimal conditions, it is advantageous to find a compact melting resin here, so that it can easily reach the next higher glacier basin with the aid of a hardening iron and a perfect return technique. The perfect return technique, the Harscheisen maybe less we will need again in the huge north flank of the Hochfirst 3403m. 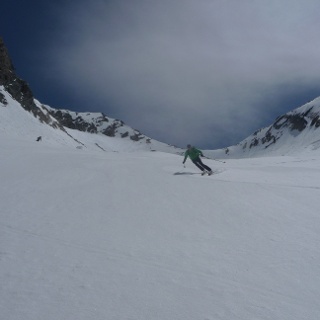 But it is already evident in this first boom that this tour is not only a perfect avalanche and snow conditions, but this tour should be reserved for experienced winter mountain climbers with the necessary skills and know-how. 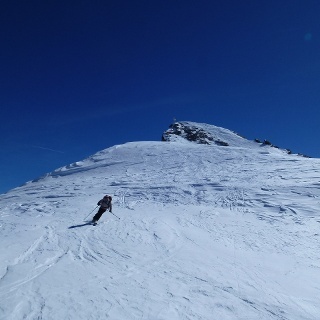 From the Hochfirstferner it is then again at first a pleasant slope up to the edge of the north flank, which has an average inclination of 40 ° at the latest from the edge gap over 200 altitudes and in the steepest passages even to 45 °. 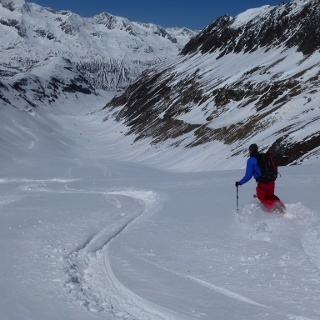 At the latest from here you should really only look for an absolutely safe avalanche situation. Once the ski depot has been reached, there is no problem at the Stapf up to the summit. The ridge can also be snow-free. Although there are hardly any climbing difficulties, they are usually crumbling rocks, as well as loose rubble, which are still stored on permafrost soil. On warm days when the soil is thawing, this last upturn can be quite unpleasant. In this case, a rope can be helpful. 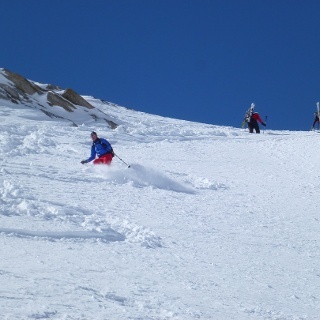 The following steep slope descends from the skies to the most demanding of what the ski area around Obergurgl has to offer and therefore it would be too late to get to know its ski-boundaries at this time. A boom is certainly not enough here, to get down safely.